Thank you for contacting H2OWIRELESS please wait for the next Customer Relations Professional. Thank you for contacting customer service, my name is Jon-H2o. How can I help you? 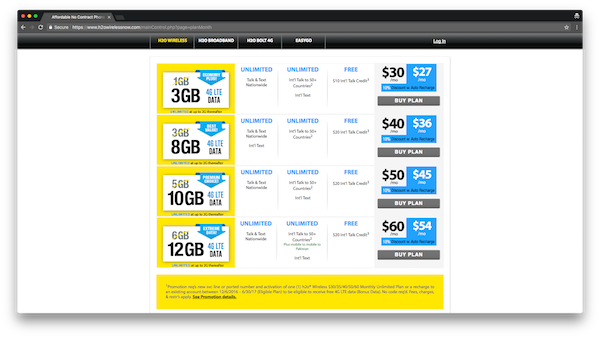 is your $30 plan with 3GB a promotion for a limited time? If I sign up with I get 3GB of data per month for as long as I keep the plan active? Allow me to inform you that the extra data on our monthly plans it is a limited plan promotion that will last until the 06/30/2017. Upon conclusion of the promotion, depending on the acceptance and feedback that we receive from our valued customers, our Sales department will advise whether modifications will be made to the amount of data provided. In order words the amount of data that will be provided after the promotion is still being verified. Do you mean you are looking into it? The amount data that will be provided after the promotion ends is still begin analyzed due to the fact that we are verifying how much data will be provided afterwards. We are unable to provide you a confirmation that you will be receiving 1 GB due to the fact that is still being verified in order to provide that amount or more data. OK. so you are waiting for someone else to tell you? This is being verified by the upper management, there is no conclusion at this moment. Updates related to the promotion will be posted on our official website and Facebook profile. OK. so you can’t tell me how much data comes with the plan… thanks that is all I need to know. It has been a pleasure to assist you. Have I fully clarified your concern today? The $30 monthly plan provides with 3GB of 4G LTE. After the promotions ends we still does not have the information on how much it will be providing. The information will be provided before the promotions ends. If you faced any other inconvenience or have any question regarding our service, do not hesitate on getting in contact with us. We will be more than happy to assist you. Thank you for contacting H2O Wireless. Feel free to fill out the customer service quality survey at the top of this chat session, it will help us improve. Also, save time and money by enrolling in our Auto Recharge Program! For more details visit: https://www.h2owirelessnow.com/mainControl.php?page=autorechargeIntro. (11:24)Your session has been ended. Thank you. Since customer service is a pain, could anyone answer the following? I have an unlocked apple 5c from sprint. Would it work on h2o wireless? Keep in mind that MMS picture messages and group texts will not work with H20 Wireless and the iPhone. I don’t know if those features are important to you.